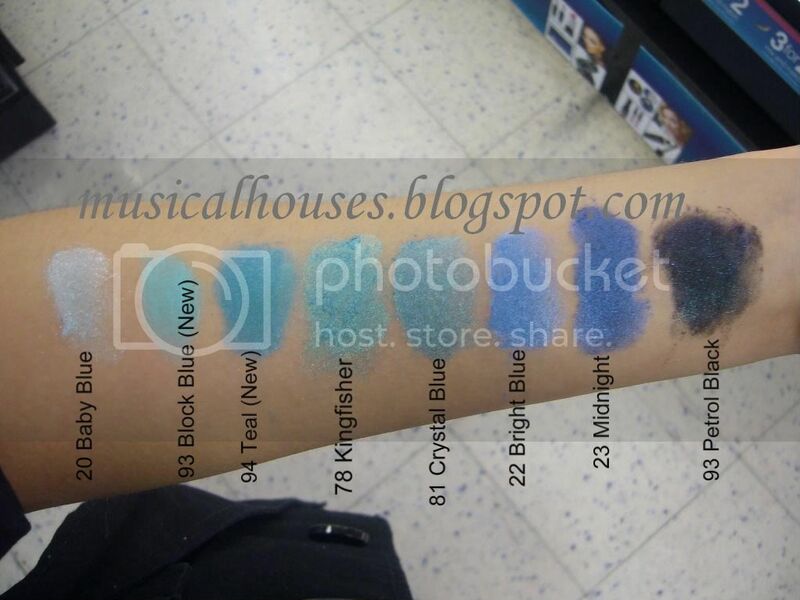 Today's Barry M Dazzle Dust swatches focus on the blues. For the unintiated, Barry M is a very popular drugstore brand that has even found a following across the Atlantic, in the great ol' USA, and the Dazzle Dusts are one of their most popular items. They have a lot of colours, which is why the swatches are going to take up 6 entire posts...I hope this doesn't bore you! The Dazzle Dusts in particular are cheap, cheerful, and have some really kickass colours. Most of them also have some form of glitter or frost finish, so they may not be the best choice of loose eyeshadows for those who are looking for something completely matte. Today's swatches feature colours with more muted glitter. Bably Blue 20 is a very very light blue - so much that it looks to me to be more of a blue-tinged white than anything else. This one has small white glitter bits. Block Blue 93 (New) is a pale blue that still packs a punch - it's a pale colour, but it isn't a wimpy pastel, as it's quite bright. This one is one of the more matte colours, so it's great for anyone who doesn't like glitter. Teal 94 (New) is a bright blue with just a smidgen of green. It isn't my idea of teal, although it is a pretty colour. It has some fine shimmer. Kingfisher 78 is a hybrid of Teal 94 and Block Blue 93. It has the colour base of Block Blue 93, but mixed with the punch of Teal 94, and it a frosty glitter finish that is all it's own. Crystal Blue 81 is like Kingfisher 78, but with the base colour of Teal 94 instead of Block Blue 93. Bright Blue 22 is blue, with a tinge of violet in it. Unlike the other blues, with had some green in them, this one has some purple in it instead, making it a cooler colour than the previous shades discussed. Bright Blue has a similar finish to Crystal Blue and Kingfisher. Midnight 23 is a cobalt blue, not too dark or light, and it has a frosty shimmery finish similar to Bright Blue, Crystal blue, and Kingfisher. Petrol Black 93 is absolutely gorgeous. It's like blue stars in a night sky! I love it. Small blue glitter suspended in a black matte base. The glitter really pops in this colour. The thing I like about this colour is that the glitter is relatively fine, too. It's not as chunky as I expected. Ooooh Kingfisher and Petrol Black are gorgeous!